This past week I was saddened to see the UN Intergovernmental Panel on Climate Change (IPCC) report that paints a grim picture of the current status of climate change and the future projection of this century. This report was commissioned during the 2015 Paris summit on climate change. It’s a wake up call to the world. 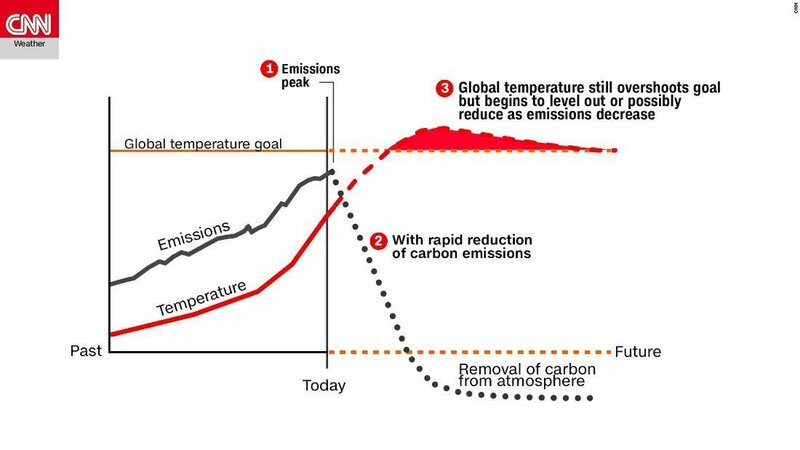 In summary, the report says that as early as 2030, some 11 years from now, we will have warmed the planet by 1.5° Celsius (2.7° F), which will have extreme repercussions throughout the world in terms of drought, extreme weather, wildfires, flooding, death of ecosystems, food shortages, etc. We have already warmed 1° from pre-industrial levels due to our greenhouse gas emissions, which is already having many harmful effects, and keeping it from rising more than 1.5-2° will entail radical changes of society within the next decade, including many changes in energy, transportation, industry, buildings, manufacturing, consumption, etc. I’ve read several articles in response to the report over the past week, and most of them are not optimistic. While it may be physically possible to stop warming more than 1.5°, the reality is that society does not change nearly fast enough. In 2017 global carbon emissions actually reached a record high. But they need to fall 45% from 2010 levels by 2030 to keep warming to 1.5°. If they don’t, we could see a 3-4° rise in temperature during this century, the effects of which are unspeakable. This may be one of the greatest challenges humanity faces this century, the test of our time. We need to awaken on a global scale to our relationship with this Earth. It is not merely something we can use and exploit with abandon. It is actually what we are, and we need to care for it as we do for ourselves. The well-known Buddhist teacher and author Thich Nhat Hanh wrote a statement ahead of the 2015 Paris summit, which I think is beautiful. I think Hanh expresses well how we need to regard the Earth. It is spiritual and practical. We need to radically change our minds (Greek metanoia, “repent”). I will quote from Hanh’s statement, and then add comments. In the Judeo-Christian-Islamic worldview, we are each “Adam,” from the Hebrew adamah, meaning ground or earth. The mythical Adam is told by God in Genesis that he comes from the “dust of the ground” (Genesis 2:7), and he will return to this ground, this dust (Genesis 3:19). We come from out of the Earth, and we return to it. The atoms and molecules that make up our bodies are literally from the Earth. The Earth birthed us, and we remain in a dependent relationship to it. The Earth is our mother, nourishing and protecting us in every moment–giving us air to breathe, fresh water to drink, food to eat and healing herbs to cure us when we are sick. Every breath we inhale contains our planet’s nitrogen, oxygen, water vapor and trace elements. But it goes further than that. We were not only birthed by this Earth, and are being sustained by it, but we remain at-one with it. The Earth is what we are. We are Adam. We are the Earth come to life, breathed to life, and we can see this life all around us as well. What we see around us is not separate from us, but is what we are made up of. We are made up of the elements that surround us, that make up our bodies, and allow us to think, and move, and live. We’re not separate from the environment, but rather we emerge from it, and it is us. The Earth is alive, and we are it. We are that great being, and that being surrounds us as well. If we care about our lives, about our being, then we will care about that which surrounds us, including the whole Earth. This is the awakening we need to deal with the climate change challenges that face us in the next few years. This is how we prevent our own being’s illness and great suffering. We need to be moved to protect the Earth as we would ourself, because it is our Self. We need to realize who we are, awaken to our deep interconnectedness and relationship to this world, and change our lives. We need to fall in love with the Earth. Only when we’ve truly fallen back in love with the Earth will our actions spring from reverence and the insight of our interconnectedness. Yet many of us have become alienated from the Earth. We are lost, isolated and lonely. We work too hard, our lives are too busy, and we are restless and distracted, losing ourselves in consumption. Feeling we are separate from the Whole is the overarching symbolism of the Fall of humanity. We left God’s presence in the beautiful Garden, and in our separation entered a dark and dreary world of our preoccupations with business, money, growthism, consumerism, consumption, manufacturing, gluttony, entertaining ourselves, and polluting. This leaves us feeling distracted, broken, anxious, and depressed. But the Garden is still there, if we are mindful, become conscious, and truly look with our whole being. We live in the Garden, and yet most of us don’t see it. Eden is right where we are, always, but it is us, our mode of consciousness, our perception, our egoic self, that separates us from experiencing it. But when we see the world as it really is, we are awed by its majesty, its grandeur, its beauty. If we allow this to penetrate us deeply, we may see those same qualities within ourselves, being of the same nature as the Earth and all beings, and come to realize our unity with it all. This unity is Love, atonement (at-one-ment). Many of our pursuits do not bring this deep sense of unity with the Earth and others around us, this deep sense of Love and satisfaction. They just further alienate us from the Earth and from one another. Our consumerist culture needs to change, and it will only change if we change. We cannot continue manufacturing and consuming at these levels. We are always wanting more things, more gadgets, more products, more shopping, more money, more fame, more celebrity. We always think that it is the next thing will make us happy, that next phone, next job, next promotion, next vacation, next boat, next car, next home. It’s the next thing that will make us satisfied. But it never does. It never brings happiness. We may be content for a short time, but then we look to the next greater thing, and the cycle continues. True happiness can only be found in the present moment, grateful for what we have in the present. Until we can find that happiness in the present, within ourselves, we will only continue to seek it outside, in products, things, other places, other possessions. Happiness is not something we attain, it is something we are, it is a state of being, a state of consciousness, a state of appreciation and gratitude, of humility and dispossession/detachment from things. We need to return to more simple living. When we wake up to what we are, the being we are, when we change our mind and consciousness to become deeply aware of our body, our surroundings, our life, our perceptions, we appreciate them at that same deep level. Life itself seems to become very deep, every breath, every glance, every motion, every breeze, every bite and taste, every step. Each and every moment can become an absolute delight, if we take time to pause, meditate, and contemplate life in all its depth. Realizing the depths of Life is realizing Love, it’s realizing God. Our culture consumes at reckless speeds the nature that surrounds us. Our endless seeking of pleasures outside of ourselves means endless consumption of things. We continue to shape the dust of the ground in a multiplicity of different permutations, seeking fulfillment in those things. But our consumption can be far less if we learn to become content with simpler things. Thich Nhat Hanh has elsewhere taught that one of the best things that we can personally do to help the climate change problem is changing to a plant-based diet. My family has done this a couple years ago, and is now mostly vegetarian. The reason this is so impactful is because all forms of meat take far more land, water, and resources to grow, maintain, and transport than do plants, fruits, vegetables, grains, etc., and this takes an enormous toll on the world. A good recent documentary film about this is Cowspiracy: The Sustainability Secret. We need to realize that everything we consume, whether it is for external use or diet, is either helping or hurting the environment. We need to be the change we wish to see in the world. It starts with each one of us. Homo sapiens (“wise man”) needs to become truly wise, we need to wake up, we need to be deeply conscious of ourselves, who we really are, our true Self, our unity with the Earth, with each other, with the Cosmos. We are a global society now, and we need to start thinking globally, as the human species that is shaping this planet for better or worse. We’re not merely shaping it, we are shaping ourselves. It is us. How do we want to be? Separation needs to be countered by communion. Division needs to be cured by unity. Individualism needs to be found within the group, with community, with cooperation, on the local levels of our home, church, business, club, and town, and also on larger levels of state, country, and world. Alienation from one another needs to be changed to cohesion. We need to begin to work together as One if we are to solve these challenges that face us. All civilisations are impermanent and must come to an end one day. But if we continue on our current course, there’s no doubt that our civilisation will be destroyed sooner than we think. The Earth may need millions of years to heal, to retrieve her balance and restore her beauty. She will be able to recover, but we humans and many other species will disappear, until the Earth can generate conditions to bring us forth again in new forms. We humans think we are invincible. We don’t think we could ever go extinct. We may think God will save us, that God will rescue us from ourselves. We don’t realize that God has incarnated as us! As the Christian mystic Meister Eckhart once said, the eyes through which we see God are the same eyes through which God sees us. They are the same eyes! We are One. Until we realize this divinity deep within us, within our very nature, and all around us, we will continue to be alienated from one another in our egos, separated, lonely, broken, and continue this downward spiral of the destruction of the Earth, of ourselves, and of God. God is grieving, because God is our world, God is its being, God is the life on it, God is the life in us. When we awake, and become truly aware and conscious of reality, then we know God’s being in us and all around us, in all beings. We are no longer separate from God, but we work in God, as God, for the well-being of all beings, for all of life and creation. This is redemption from the Fall. This is salvation, atonement, liberation, enlightenment. This is Love. This is Christ at-one in the Father. This is Buddha-nature. This is Atman at-one in Brahman. This is what all the mystics, prophets, sages, saints, gurus, shamans, and other wise and holy people have pointed to for ages. This is compassion, suffering with and feeling with the other, as One with the other. The “other” is our Self. It is all our Self. Once we can accept the impermanence of our civilization with peace, we will be liberated from our fear. Only then will we have the strength, awakening and love we need to bring us together. Cherishing our precious Earth–falling in love with the Earth–is not an obligation. It is a matter of personal and collective happiness and survival. Falling in love with the Earth is falling in love with our Self, it is falling in love with God, it is cherishing and loving and protecting and nourishing the Life the Earth has given us, and that is us. Will we make the radical changes needed in our society to prevent catastrophic climate change? I don’t know. What we can do is start making changes to our self, to our consciousness, to our mind, to our life and how we are consuming and using the resources of the Earth, in recognizing what we are doing on a daily basis that is either hurting or helping. We can wake up personally, help those around us wake up, and the more of us that wake up, the more society will wake up. Previous postWhat is “Eternal Life”? Next postWhat does it mean to be “a god”?